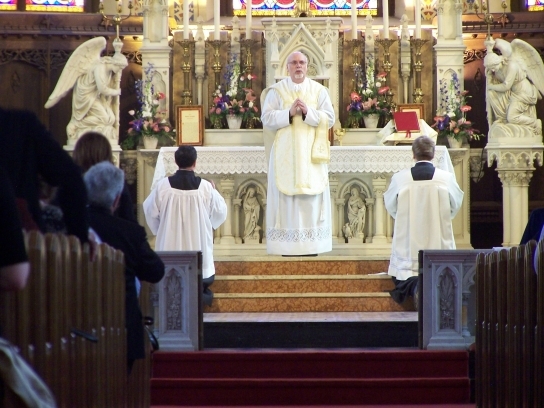 The Latin Rite of the Roman Catholic Church offers the Holy Sacrifice of the Mass in two forms: After the liturgical reforms of the Second Vatican Council, most parishes offer the revised Mass, known as the “Novus Ordo” or “Ordinary Form” of the Mass, partially or entirely in the local language. 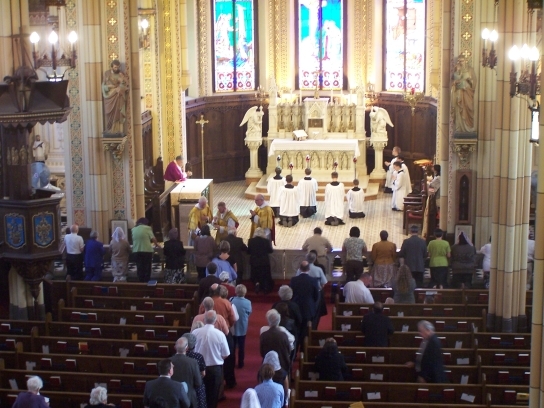 The pre-Vatican II Mass, known as the “Tridentine” or “Extraordinary Form” of Mass, has enjoyed a resurgence in popularity in recent years for a variety of reasons. The elaborate prayers, the Gregorian Chant and sacred music that accompanies the Mass, and the precise rubrics that guide the celebrant and altar servers create a prayerful atmosphere that unites one with the faith of one's ancestors. In 1991, the Diocese of London, Ontario introduced the first Tridentine Mass in metropolitan Detroit, in Windsor, Ontario, Canada. 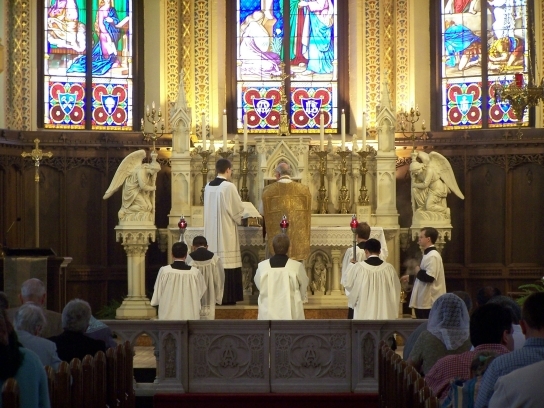 The priests, musicians, altar servers, and volunteers behind the Windsor Tridentine Mass have since helped other Tridentine Masses get started in the Diocese of London, the Archdiocese of Detroit, and the Diocese of Lansing, Michigan. 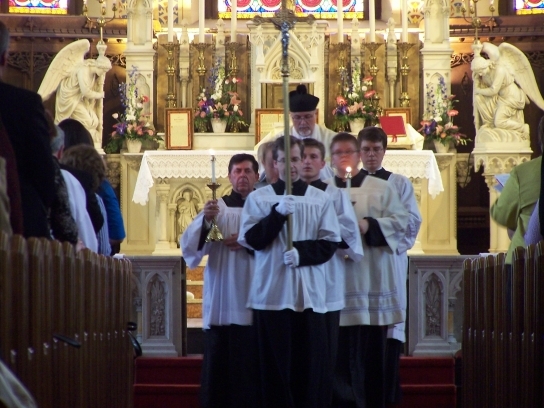 As the original home of traditional liturgy in our region, the St. Benedict Tridentine Community is often called upon to send our choir and altar servers to participate in special Latin Masses held elsewhere. We enjoy a close partnership with St. Hyacinth and St. Albertus Churches in Detroit, which also offer the Extraordinary Form of Holy Mass. In 2007, our Holy Father, Pope Benedict XVI, widened permission for the Extraordinary Forms of the Sacraments to be celebrated. In addition to the Traditional Latin Mass, St. Benedict offers all of the Holy Sacraments according to the Traditional Form: Baptisms, Weddings, Confession, Extreme Unction, and with sufficient demand, Confirmation. Funerals and Requiem Masses are also available upon request. 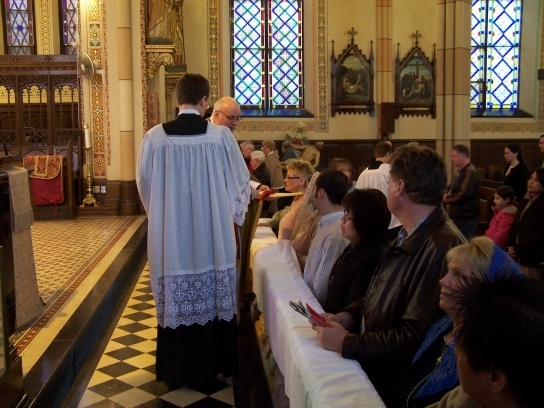 Confessions are held before Holy Mass each week. Please contact Fr. Peter Hrytsyk to make arrangements for the other Sacraments. Download our Welcome Brochure here (formatted for double-fold legal size paper). Forms are available at the back of the church to request Mass Intentions. Fill one out and place it in an envelope along with a Mass stipend of $10. Drop the envelope in the collection basket. Mass Intentions are published in the weekly Handout. Pick up a Registration Form at the back of the church before or after Mass. St. Benedict is a non-profit entity under the Diocese of London that pays all expenses related to the Latin Mass and takes up the primary collection at each Mass. We maintain our own Sacramental Records and have our own Parish Pastoral Council and Finance Council. All contributions to the St. Benedict Community are tax-deductible, and year-end tax receipts are provided by the diocese. For information about Assumption Parish not pertaining to the Latin Mass, contact the Parish Office at: (519) 253-2493, or visit the parish web site. We invite all men and boys who have received First Holy Communion to serve at the altar. No experience is necessary; training will be provided. It is a great privilege to serve at the altar, and an excellent way to learn more about the Sacred Liturgy. Contact server Alex Begin in the sacristy after Mass or e-mail info@windsorlatinmass.org for more information. or call (519) 734-1335 from Canada or (248) 250-2740 from the U.S.